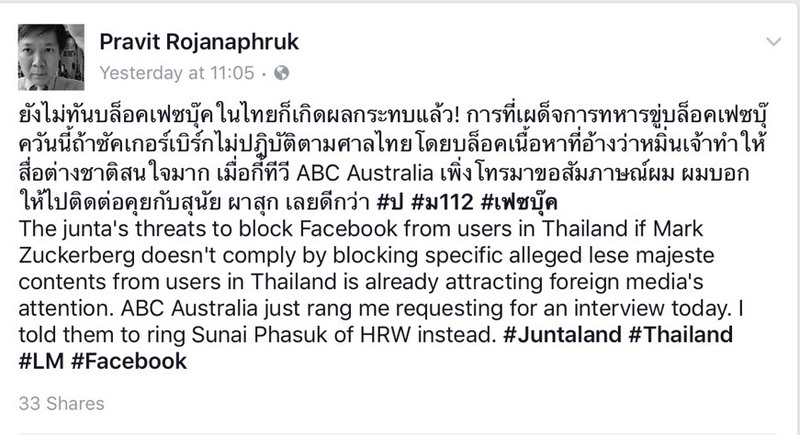 Mr. Pravit Rojanaphruk's Facebook Post. What I found so amusing about this particular post is that, he blocked me. Yes, I was blocked by him, a self-proclaimed to be fighter for Human Rights, and defender for all kind of freedom of speeches in Thailand, but end up blocking me in Facebook for telling harsh truth. But I was not surprised that he blocked me, because I got used to what most Liberal™ would have done to me, because I spoke out truth and only truth with logic and rationality, whilst these Liberal™ are way beyond, or perhaps I would say, we flew at totally different altitudes, never-mind whose is higher. What a self-contradictory person they are? Or should we say, Hypocrite?